On a cold and damp evening, our first Chapter meeting of 2016 exceeded all expectations. We had a superb turnout of 83 members! Thanks to everyone for making our meetings so worthwhile. Mandy Thompson was welcomed as the new Secretary for the Chapter – the role of Secretary and Membership Officer will be combined going forward. The Editor post and the H.O.G. on the Tyne (HOTT) magazine will be phased out to meet demand for an electronic version. We will have a live version on our website soon. Contributions are always welcome! Jon Greenwood has also been in touch about Biker Flood Buddies (BFB), looking for help from other Chapter members. It was set up in response to the floods in the Yorkshire area, specifically for bikers to help flood victims, particularly those not adequately insured. BFB puts fellow bikers, who wanted to help or donate, in touch with those who needed it most. There is a brief lull at the moment as homes dry out but when people start to move back in, there will be a need for furniture, household items, clothes and white goods. Everyone is encouraged to help, where they can. Get in touch with Jon directly or through the website. 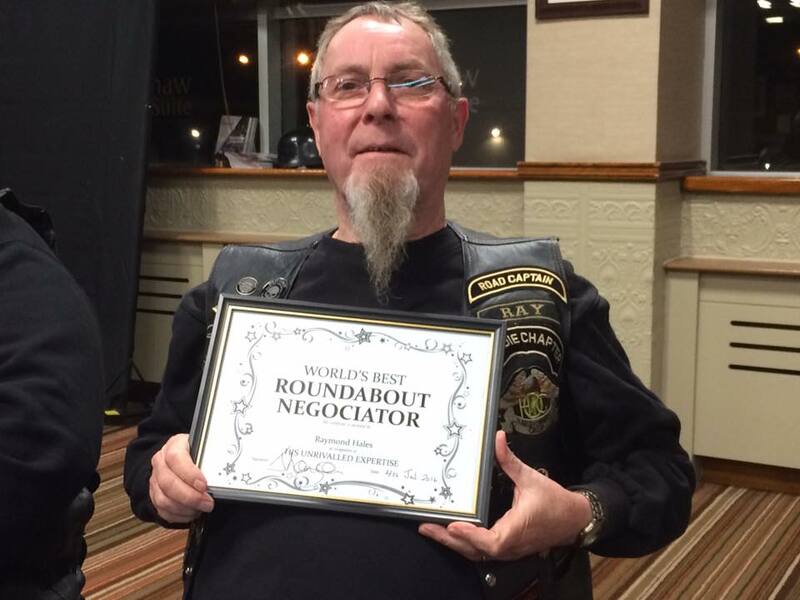 John Langan presented Ray Hales with an award – World’s Best Roundabout Negotiator, for his expertise and fondness for visiting roundabouts … often again and again. Ray was stunned and shocked but most appreciative. His mumbled words, of what we assume were thanks, were inaudible to those even at the front of the room. Thanks to everyone who attended and contributed to the Santa Ride in December. We made a donation to Percy Park Rugby Club for new strips and we handed over the collected toys to the Salvation Army. Have a look at the website news feed for more information on this. Paul Wright did a great job in organising the toy collection. Greg then led us up to the RVI, in some truly awful weather, where we handed over portable DVD players for the children. Our next meeting will be our Annual General Meeting (AGM) and we’ve got pie and peas arranged for you all. You’ll also be able to vote for some vacant Committee posts. We have a few to be filled: Assistant Director, second Ladies of Harley Officer and Historian. Remember to bring your Geordie Chapter membership card – you’ll need it to vote. Mandy has posted further details on our closed Facebook group. Mandy is also collecting nominations for the Geordie Chapter Member of the Year. Use the email address on the Facebook group to get in touch, or the Contact Us form on the website.